As you read on the homepage my name is Rhiannon. I am 42 years old, and have no children. The dog-daughter life suits me. I have been in love with dogs all my life! I used to “borrow” the neighbors dog when I was 5 years old. I have owned a pet sitting business in my home for over a decade. All our guest dogs that board with us have their own private room and yard! I could not ask for a better job! 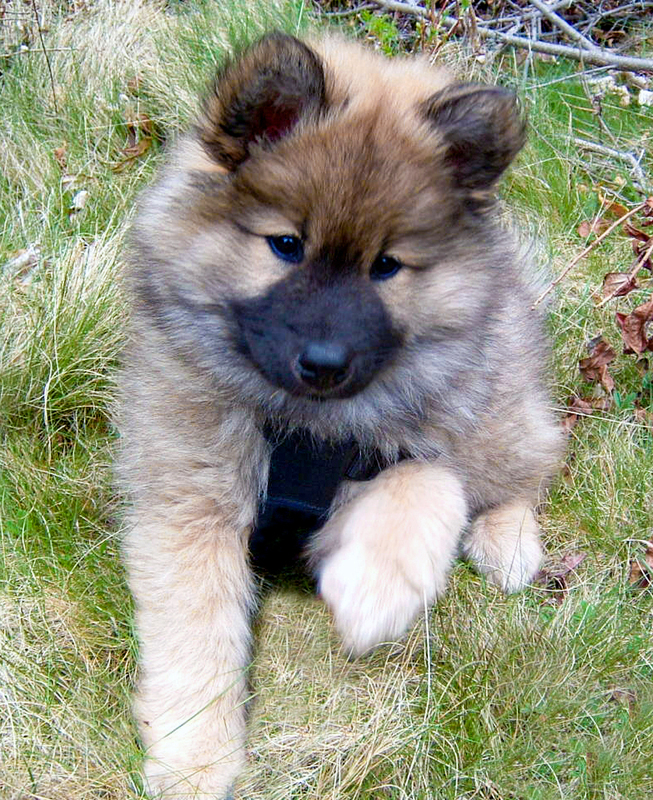 Our Eurasier journey began in 2006 when my husband and I starting looking for a breed of dog that fit our lifestyle. We started in alphabetical order of all dog breeds. 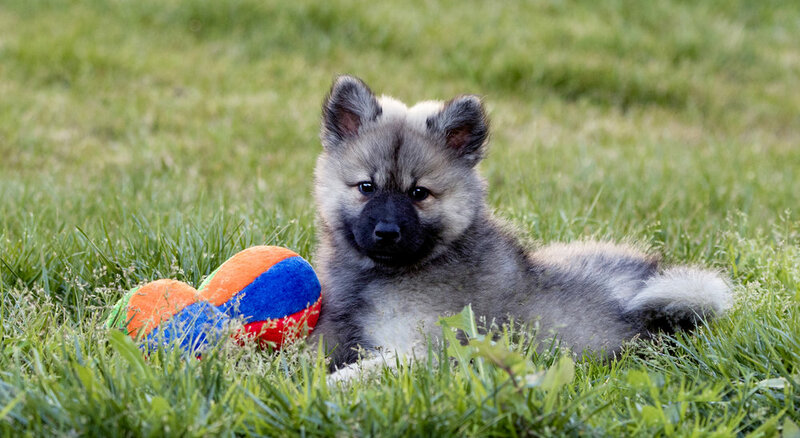 We worked our way through the list until we came to “Eurasier.” We both had things that we wanted in a dog and this breed fit both of our lists perfectly to a T! After reading and researching further, the only bad thing was that there weren't any close breeders. We waited 2 years to bring home the love of our life Lena in 2008. I flew to Nova Scotia Canada from Southern California to pick her up. An 8000 mile round trip. We were both smitten and fell in love with her immediately. Lena has many typical Eurasier traits: she is calm, observant, sensitive, very very sweet, extremely intelligent, and quiet (rarely barks). She is also reserved with strangers but not aggressive or mean, she just wants to smell people before they pet her. She is cautious, and will look before she leaps. Photos below are Lena at 9 weeks, 4 months, and 9 years old. Then in 2015 our search began again to add a second dog-daughter to our family. In 2016 we brought Braxee home from the UK. She is quite different from Lena, in that she is very energetic, playful, silly, goofy, curious, extremely friendly to all people and animals, and loves water (she began swimming in our pool on her own at 13.5 weeks old!) They both share several qualities such as being sweet, quiet, beautiful, intelligent, and have a go-with-the-flow demeanor. They were both very easy to train and we have a very harmonious home with two intact females. Photos below are Braxee the day we brought her home at 8 weeks and then again, 1 year later! They certainly can change colors! What sets me apart from other breeders is that I am a NR (natural rearing) breeder. Please read that section of my website for more information. I will also be following a program called “Puppy Culture.” From early neurological stimulation, to emotional resiliency exercise, to leash walking, potty training, problem prevention, and more. You can read more about it by clicking on the “Puppy Culture” logo on the bottom of this page. It will take you to their website where you can read and watch videos about it. Amazing stuff! Besides my girls, my other passion is photography! I enjoy it immensely, and will of course provide beautiful photos of the puppies growing up. I am a very open, honest, and transparent person. If you have any questions please do not hesitate to contact me. I live in Murrieta, CA, a town in between Los Angeles and San Diego. I am member of the United States Eurasier Club, Eurasier Club of Canada, Southern Eurasier Association UK, and the Natural Rearing Breeders Association. You may be wondering, what does Braxena mean? I spent years contemplating a kennel name. I wanted it to be truly unique and unusual just like the amazing Eurasier breed. Nothing I ever came up with sounded right. Then when we were getting our second Eurasier, I made a list of about 15 names. I asked my husband and both in-laws individually which name they like best. None of them had known which name the other picked, but they all ended up picking Braxee, which was a name I completely made up! So our new puppy's name was decided. Our first girl we named Lena. I spent much time playing with both my girls names, Lena and Braxee, trying to combine them into a new word. I finally came up with Braxena! I loved it right away, and that's how my kennel name was decided. Results of Albionspitz Braxee Cari Health tests: PASSED! OFA Hips: good, X-rays were also sent to UK for a permanent rating, they were scored a 7, which is better than the median. In addition to Braxee passing her health checks, I was lucky enough to have Monika Petermayer from Austria do an official breeding confirmation evaluation of Braxee when she was visiting San Diego in 2018. For those that do not know of her, she is a very important international judge that has evaluated thousands of Eurasiers over her 30+ year career. This is a huge deal that not many in North America have the privilege to obtain. I am very excited to show that Braxee got high marks in her evaluation! Below is Albionspitz Braxee Cari’s picture pedigree that I made. It goes back 4 generations! The Eurasier breed was developed in Germany. The first litter was born in a town called Weinheim in 1960. Originally Dr. Julius Wipfel used a combination of specially chosen Chow Chows and Wolf Spitz. The Chow Chow that is around North America now is not all like it was during the 60's. The European Wolf Spitz was similar to the old American Keeshhond. The combination of these breedings were named the "Wolf Chow". Julius Wipfel’s goal was to breed a healthy, calm companion dog. He wanted to re-create the ideal family house dog. In 1972 the Samoyed was introduced to the breed and the name was changed to “Eurasier.” A year later in 1973, the breed was recognized and registered with the German Kennel Club. 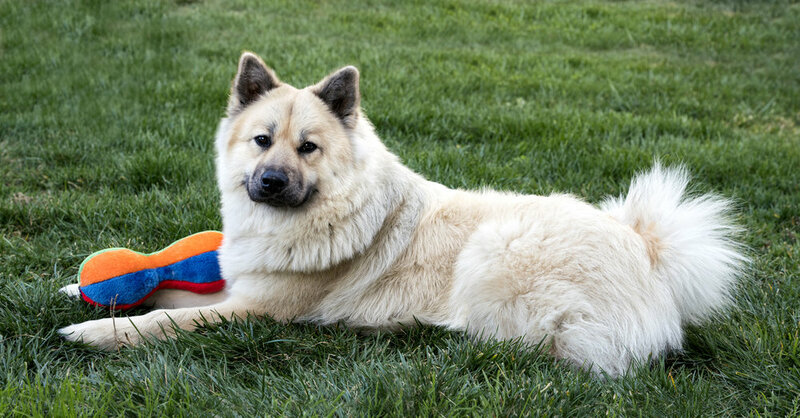 The Canadian Kennel Club recognized the Eurasier as a pure bred dog in 1995. As of 2018, they are not recognized in the United States, but many of us prefer they remain a well kept secret so they do not become exploited and ruined. I have found both of my girls to be very different in energy levels, but many traits remain constant. Eurasiers are highly adaptable, they love doing whatever the family is doing. It is important to know that Eurasiers cannot be kept in kennels or as an outside dog. They need close contact with their families. They were bred to be the perfect companion family dog so their “job” is to be with you. It is not recommended to get a Eurasier if you work outside the home full time. Eurasiers are an extremely intuitive and intelligence breed. They are not barkers like many spitz breeds tend to be. Other defining traits are: observant, calm, alert, tender, careful, loyal, playful outside, good natured, sweet, regal, and emotionally sensitive. They are very in tune with their family, and are loving, tolerant, and patient with children and other pets. They can play all day long, or be calm and relaxed as well. They are reserved with strangers, not aggressive, but they like to keep their distance and observe before they meet new people (except my Braxee who LOVES everyone right away, she is an extremely friendly and outgoing Eurasier.) haha. Eurasiers are a strong and sturdy medium sized dog. Males range between 50-70 pounds and have a shoulder height between 20.5 to 23.5 inches. Females range between 40-60 pounds with a shoulder height between 19 to 22 inches. Eurasiers are a double-coated breed, but my intact eurasiers don't need to go to the groomers because they are so easy to groom myself most of the year. Brushing/combing once a week is sufficient. Some people are under the impression that long haired dogs shed a lot, but the truth is, long haired dogs actually shed much less than short haired dogs. Eurasiers really only shed when they “blow” their undercoat (which happens once or twice a year depending on where you live). At that time, it can take a bit more work and effort to groom, but it is still much easier than grooming a spayed or neutered Eurasier. When a dog is spayed or neutered, their hormones are greatly affected causing dramatic changes to their coat. The hair grows much longer, thicker, and tangles more easily. One more reason (added to the long list of reasons) to keep your dogs intact, especially in breeds with coats. Eurasiers come in a whole variety of colors: red, cream, wolf-grey, black and tan, solid black, and so many variations in between! In my opinion, their color diversity makes them extra special, and is something I really love about them. You can have several Eurasiers, and yet, they all look different, unlike some breeds that all look the same. The Eurasier is remarkably stunning no matter which color they are. PLEASE NEVER SHAVE your EURASIER! It will ruin their coat forever! They naturally control their body temperature with their coat, they are not kept cooler without it. In fact, Eurasiers will be hotter if you shave them, and they will get sunburns! Also shaving them will permanently damage their coat. Only light trimming of the sanitary areas is recommended, if necessary. Tip: Save the fur every time you groom! I saved all Lena’s fur from the beginning, and I sent it to Germany when she was 8 years old to have it spun into yarn. I will have a blanket or sweater made from it someday. 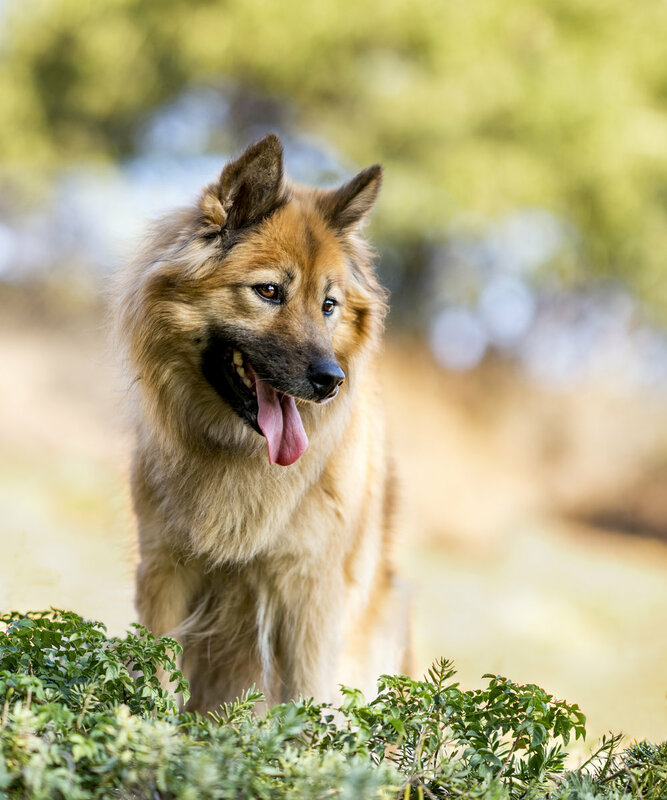 Does the Eurasier SOUND LIKE THE PerFECT BREED of dog? Well, we certainly think so!